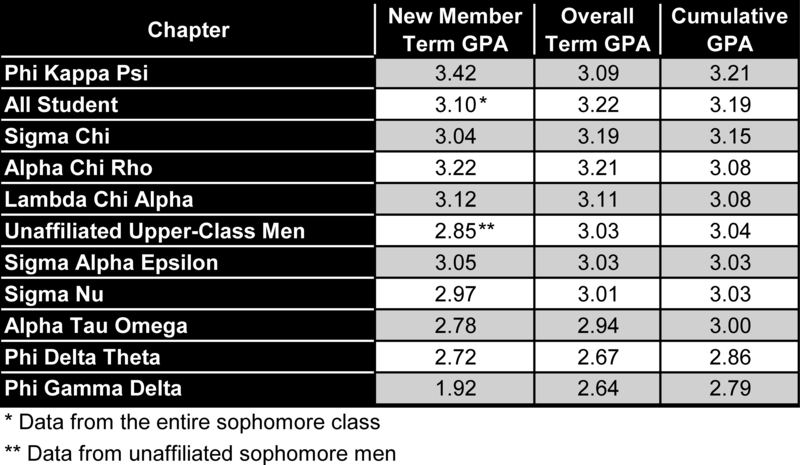 Greek Grade Reports Released: Phi Gamma Delta New Members Post 1.92 GPA in Fall 2017 | The Gettysburgian. Along with the chapter evaluations, the Office of Student Activities & Greek Life (OSAGL) released fall 2017 grade reports for Greek organizations. Sororities posted a 3.39 cumulative average for the fall semester, an increase from 3.34 the previous spring, while fraternities posted a 3.00 cumulative average for the fall, a decrease from 3.05 the previous spring. Alpha Delta Pi led all Greek organizations by recording a 3.52 term average and was followed by Alpha Omicron Pi with a 3.47 and Sigma Sigma Sigma with a 3.41 for the fall 2017; unaffiliated upper class women had a term average of 3.43. The lowest sorority term average – 3.21 by Gamma Phi Beta – tied Alpha Chi Rho, which held the highest fraternity term average. Sigma Chi recorded a 3.19 term GPA, and Lambda Chi Alpha recorded a 3.11 for the fall semester. Phi Delta Theta and Phi Gamma Delta recorded the lowest two scores among all Greek organizations with 2.67 and 2.64 GPAs respectively. Phi Gamma Delta’s seven new members recorded an average GPA of 1.92 for the fall semester; to join a fraternity, one must hold at least a 2.5 GPA, while, to graduate, one must hold at least a 2.0 GPA. He said that OSAGL has had conversations with the chapter’s leadership, alumni organization, and national organization about what contributed to the low performance, and, while he could not discuss specifics, he suggested that, in some cases, outliers can weigh down a mean. Fernando Porras ‘18, who was President of Phi Gamma Delta during the fall, said that the outgoing and incoming executive boards discussed this issue “at great length,” but he said that the chapter does not consider the 1.92 figure to be an “accurate representation of our new members’ commitment to their academics and brotherhood” and also mentioned the potential for outliers to affect the mean. Gurreri said that, when new members post low GPAs, hazing is always something that the college considers as a possible factor, but that OSAGL received no reports of hazing involving Phi Gamma Delta this fall. “To this point, there has been no indication that [hazing] was one of the things that contributed to this year’s low performance, but that’s certainly something to be mindful of,” Gurreri said. Casamassima acknowledged that hazing has been an issue for the organization in the past, the organization has a zero-tolerance policy for hazing now. Porras echoed the zero-tolerance policy about hazing and said that, while new members may have an adjustment period, he believes membership in the chapter has a long-term positive impact. Gurreri said that a variety of options are on the table to improve Phi Gamma Delta’s academic standing moving forward including shortening or reducing the number of events associated with their new member education period and strengthening their engagement with the Office of Academic Advising. Casamassima said that the chapter has made efforts to increase mandatory study hall hours and engage with faculty advisor Jeffery Williams, Adjunct Instructor of Cinema & Media Studies. But, he stressed that recruiting is a primary area through which the organization hopes to improve its academic standing. In spite of the 1.92 GPA for new members, Phi Gamma Delta earned a “satisfactory” rating for Academic Achievement and Intellectual Engagement and an overall “satisfactory” rating in their 2017 Greek Evaluation. Overall, four of nine fraternities outpaced the unaffiliated men’s average while two of six sororities exceeded the unaffiliated women’s average. Gurreri said that the question of whether Greek organizations have a positive effect on academic performance is complicated, but that the college is encouraged by recent progress and the trajectory looking ahead. So you basically just posted public information for click bait… Someone’s mad they didn’t get a bid. No wonder why.